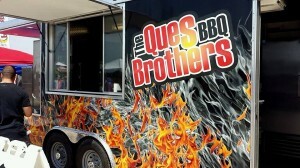 Welcome to The Ques Brothers BBQ home page. We specialize in catering many different venues such as outdoor events, corporate and sporting events, graduation parties, backyard barbeques, weddings, holiday parties and many more. Our mobile custom BBQ trailer allows us to prepare and cook on site with no effort on your part. We can provide a catering experience that will surpass all of your expectations. Let us cater your next event and show you how easy planning your event can be. We look forward to working with you to make your next event spectacular!